Crests or coats-of-arms tell about the history of a place or a family, the crest of the Diocese of Dallas is no different. 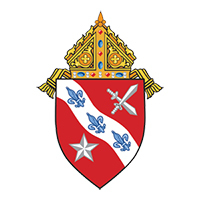 Through its imagery, the crest presents a symbolic history of the Diocese of Dallas. At the top of the crest is a bishop’s mitre, the tall hat worn by bishops that is a symbol of their office. Beneath that is a red shield with a number of objects. Red is the color of the Sacred Heart of Jesus, patron of the diocese. In the upper right hand corner are crossed swords, the symbol of St. Paul who died by the sword. It represents the mission at St. Paul, Texas in Collin County. St. Paul mission was the first Catholic Church in what is now the Diocese of Dallas. In the lower left corner is a star, it represents the Lone Star of Texas. Running diagonally is a wavy line with three blue fleurs-de-lis. The fleur-de-lis, or flower of life, is a symbol of the Holy Trinity and is also the national symbol of France. In the crest both symbols are meaningful. The wavy line represents the Trinity River, whose original name was Most Holy Trinity. Three fleurs-de-lis represent the Trinity. They also recall the French priests who first served the diocese.